Justin Bieber is a Canadian pop singer, songwriter and actor who is one of the best-selling music artists, having sold over 140 million records worldwide. His first full-length studio album, My World 2.0, debuted at #1 on the U.S. Billboard 200 and was certified triple platinum in the U.S. This album was nominated for a Grammy Award for Best Pop Vocal Album in 2011. He also became the first artist to have seven songs from a debut record chart on the Billboard Hot 100. He has won a Grammy Award and an American Music Award. 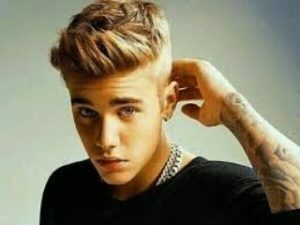 He has been listed numerous times by Forbes magazine among the “Top Ten Most Powerful Celebrities in the World.” Born Justin Drew Bieber on March 1, 1994 at St. Joseph’s Hospital in London, Ontario, Canada, he is the son of Pattie Mallette and Jeremy Bieber. He is of German, Irish, Scottish, and English descent on his father’s side, and of French-Canadian descent on his mother’s side. He has a younger half-sister, Jazmyn and a younger half-brother, Jaxon. He graduated from high school in Stratford, Ontario, the St. Michael Catholic Secondary School in 2012 with a 4.0 GPA. He placed second in a local talent competition at a young age. He was discovered on YouTube in 2008. His single “Baby” debuted at #5 on the Billboard Hot 100 chart. He was in a relationship with singer Selena Gomez from December 5, 2010 to October 31, 2012. *He was born in London, Ontario, at St Joseph’s Hospital on March 1, 1994. *His mother became pregnant at the age of 17. *His parents never married each other. *He taught himself to play the guitar, piano, drums and trumpet. *He plays the left-handed guitar. *He likes to play hockey and basketball. *He cites Michael Jackson, Ne-Yo, Stevie Wonder, Usher, Justin Timberlake as his musical influences. *Became Google’s most-searched person in 2011. *He was awarded the Queen Elizabeth II Diamond Jubilee Medal in 2012. *He was ranked number 1 on the VH1 list 100 Greatest Kid Stars in 2012. *He was ranked #10 on Glamour’s list of “50 Sexiest Men” in 2013. *As of June 2017, his net worth is $83.5 million.